Whether your fiancée-to-be has been pining after Beyoncé’s mega diamond ring, or she’s more about the proposal than the size of her rock, do yourself a favor and learn a few tips to make your diamond ring look bigger than it is. Trust me, she’ll thank you for it! A little more sparkle never hurt anyone, and there are so many budget-friendly ways to let your ring stand out. 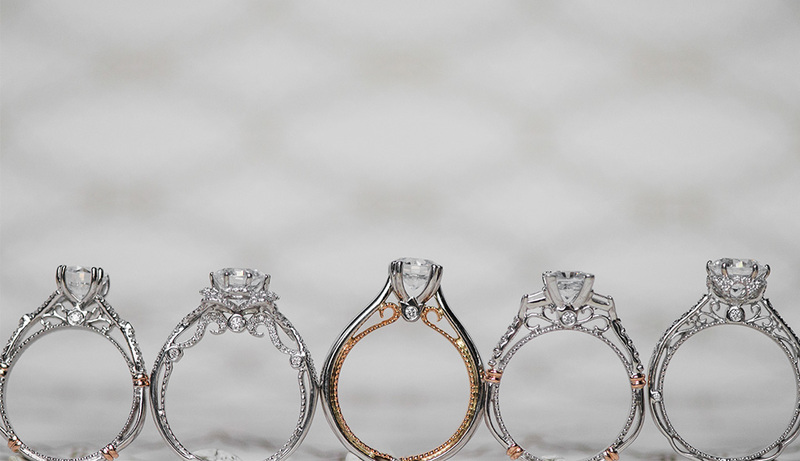 Here are affordable ways to make your diamond ring look bigger. You may not have believed that statement before, but when it comes to diamonds it’s really true! Did you know that there is actually no such thing as a diamond’s “carat size?” A diamond’s carat actually refers to the weight of the diamond, rather than the size! So instead of worrying about how many carats the diamond is, you’re better off focusing on the cut of the diamond. The cut determines how the stone catches light. When the diamond has a better quality cut, the stone is more brilliant and therefore gives the impression of being larger than it actually is. The shape of the diamond has a huge influence on how big the rock looks. If you want to increase the size of the diamond, or rather the size that the diamond appears to be, consider the diamond shape. For a more noticeable stone which seems bigger than it is, go for an elongated, fancy shape such as oval, emerald, marquise, or pear. If you put a 1 carat round diamond next to a 1 carat emerald-cut diamond, the emerald shape will appear larger and can cost substantially less. 3. SAY HELLO TO HALOS! There’s a reason why halos are such a popular choice for brides today. Halos consist of tiny diamonds surrounding the larger, center stone, creating the illusion of one very big diamond. Plus, they’re beautiful and extra sparkly! 4. IT DON’T MATTER IF IT’S YELLOW OR WHITE – BUT IT REALLY DOES! If your goal is to make the ring the main event, opt for a white metal. The stone will reflect off of white gold or platinum bands, creating more shine than yellow or rose gold bands. If you’re still determined to get a rose or yellow gold ring, no worries! You can get whatever metal you like on the band and still choose white gold prongs. That way, the white gold will shine through the diamond, giving the rock a bigger appearance. Adding two smaller side stones to either side of the larger center diamond will bring out the center stone, and enhance the ring’s beauty as a whole. Think of the side-stones as the performers who open before the big show! They’ll create a grand, luminous effect for the main act – the center diamond. The design of the ring band can create the illusion of a larger or smaller center diamond. Thin bands are great, as the diamond will appear bigger next to the band. Knife-edge settings are also an excellent choice, as their top is also a thin edge and makes the diamond look larger. Alternatively, you may want to go for a ring setting that starts out thicker on the sides and thins as it gets closer to the center stone, giving extra emphasis to the center diamond and featuring it as the main, brilliant event. Tada! You’re ready to make your diamond ring look bigger! What do you think about these tips to make your diamond ring look bigger? Let us know in the comments below, or on our social channels: Instagram, Facebook, Snapchat, or Twitter.